COLOR(S):Solid colored with or without white trim, and predominantly white with mask. 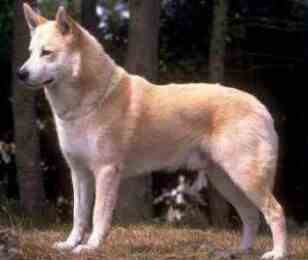 The Canaan Dog is a medium-size, robustly made, spitz-type dog. They have been indigenous to the region encompassed by modern Israel for centuries. Canaan Dogs are reserved with strangers but makes a good companion dog that is loyal and affectionate to their family. Soft and eager to please, they also need to know the rules of the house or they can become manipulative. Canaan Dogs have been used as a guide dog for the blind and as a search and rescue dog. They are known to be aloof of people and animals that they don\'t know, and are known to run away when a large change affects them, such as a new house or new person. This is how they coped when they were feral dogs in Israel. But such characteristics can be overcome with training, as these are highly intelligent and trainable dogs. They are known for their service as messenger and sentry dogs, and were once trained to detect mines. They can be barky, which makes them excellent watch dogs. Their endurance, reactability, and agility make them a popular breed in Israel.